After hugely successful open days , Medical herbalist Patrick Murphy will be hosting his Energy health screening open day at The Clayton Hotel, Galway on Saturday 13th April from 8.00am to 7.00pm using the Supertronic health screening device. 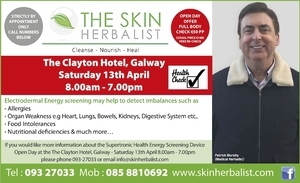 After hugely successful open days , Medical herbalist Patrick Murphy will be hosting his energy health screening open day at The Clayton Hotel, Galway, on Saturday April 13 from 8am to 7pm using the Supertronic health screening device. 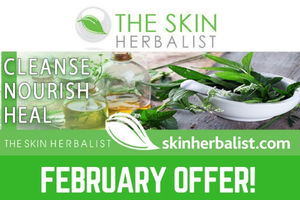 Patrick Murphy, the Skin Herbalist continues to allow customers to purchase the business' natural herbal and food supplements at the click of a button. 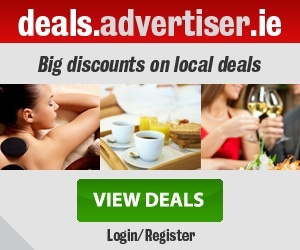 The online shop was set up to cope with huge demand from customers outside County Galway. Mr Murphy says; "We had a large demand from people who live outside County Galway. Many of them were phoning the office looking for the natural products and herbs that the business supplies, and sending in cheques and postal orders to pay which was awkward for ourselves and the customer. After hugely successful open days, medical herbalist Patrick Murphy will be hosting his energy health screening open day at The Twelve Hotel, Barna, on Saturday, February 9, from 8am to 7pm using the Supertronic health screening device. After hugely successful open days, medical herbalist Patrick Murphy will be hosting his energy health screening open day at the Radisson Blu Hotel Athlone on Sunday, January 20, from 9.00am to 5.00pm using the Supertronic health screening device. After a series of hugely successful open days, medical herbalist Patrick Murphy will host his first energy health screening open day of the year at the Clayton Hotel, Galway, on Saturday January 19 from 8am to 7pm, using the Supertronic health screening device. 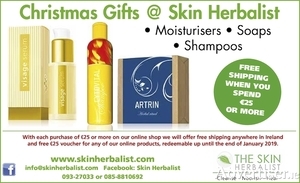 The Skin Herbalist moisturisers, soaps and shampoos, Droserin, Protektin, Artrin, Cytovital and Ruticelit are all based on unique organic herbal extracts. Besides their creams, these products contain herbal extracts, pure natural essentials oils and thermal water from the Podhájska hot spring. They are beneficial to the skin and hair and, through the energy system of acupuncture points and reflex zones. Their advantage is that they act gently, they are easy to wash away with water, and they do not unnecessarily burden our body with chemicals. Nutritive Balsam untangles hair and provides it with nutrition.